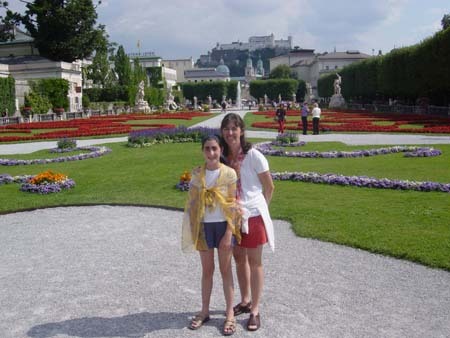 Paula: We arrived in Salzburg Tuesday evening and after a nice dinner began exploring the city which is truly magical at night. The Festung Hohensalzburg (fortress) towers above the rest of the city which peacefully mills below. The beautiful architecture and lovely classical music impresses you immediately. We enjoyed watching chess games in the square next to the Residenzbrunnen Fountain. There was also a huge outdoor screen set up where people had gathered to watch videos of operas from previous ummer festivals. Cafes line every street and were lively. 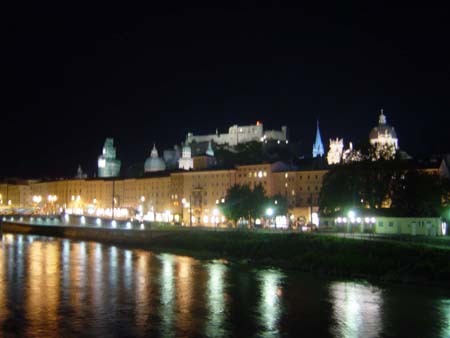 The walk over the Salzach (river running through the city) was beautiful as all the town's major sites, churches and fortress were lit and visible from this vista. We went to bed looking forward to seeing more of this lovely town. Wednesday morning we headed straight to the tourist office to purchases tickets to several concerts and a Salzburg card (providing entrance to all the major sites). 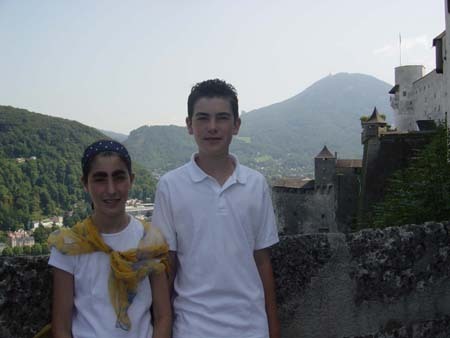 We explored the fortress and learned that it was never really fully occupied because the town was never under serious danger of attack until WWII. 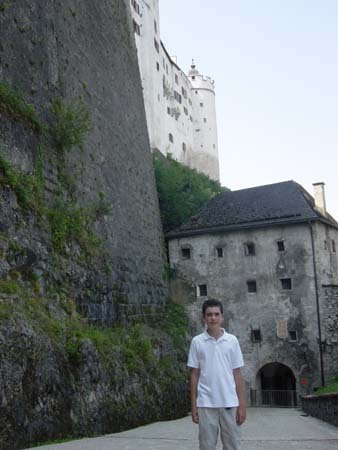 It is the best preserved fortress in central Europe and is actually built right into the mountain. 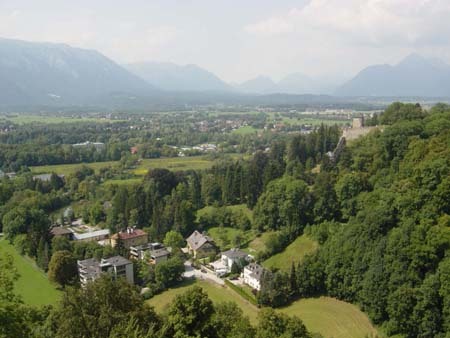 You can visually see how the fortress was expanded over the centuries and how the walls and buildings were actually carved out of the mountain (Holensalzburg means high salt fortress). This is because the area is surrounded by salt mines and is another reason the area has always been safe from capture. In medieval times salt was used to preserve meats and other foods and it was essential to survive any attempts to capture the city. We took a tour of the old city with a resident guide who was lovely. She explained over and over how proud the residents are of their peaceful heritage and lifestyle focused on music and h appiness. She emphasized that the people here have always felt safe and thankful for this beautiful refuge. The history of the city is extensive. It was established as an independent province and originally run by archbishops starting about 700 AD. The Roman Empire considered it a critical post and gateway because the river runs into the Daube River. Some of the other sites that were fascinating included St. Peter's Cemetery, the Cathedral (not given a name because it was for all the people) and The Franciscan Church. 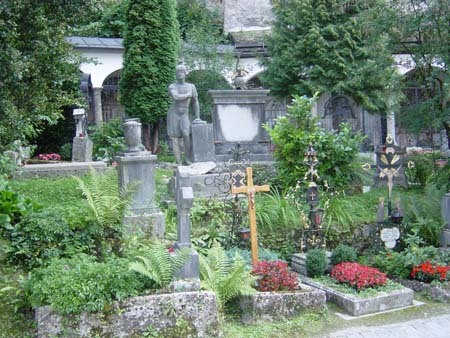 The Cemetery was fascinating because the epitaphs were iron and included catacombs that are centuries-old with family members buried on top of one another 10 feet below. Our guide also told us that everyone in town gathers in the cemetery on Christmas Eve and lights candles. 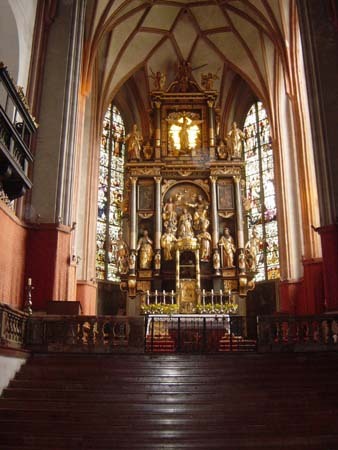 The Cathedral is huge and was built in the 700s. 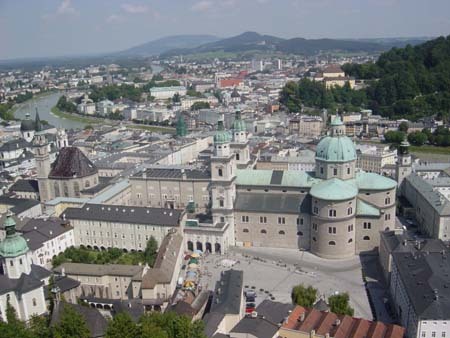 There were not many people living in Salzburg, so we were told that a law was passed requiring everyone to learn to sing so that the church would be filled with music. This law is still in place today and all children go to music school. We walked in the open market for a lunch of pretzels and sausage. 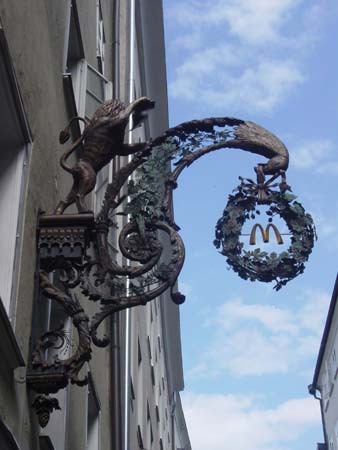 Then we walked down Getreidegasse, a shopping walkway where every store (including McDonalds) had a elaborate iron sign. 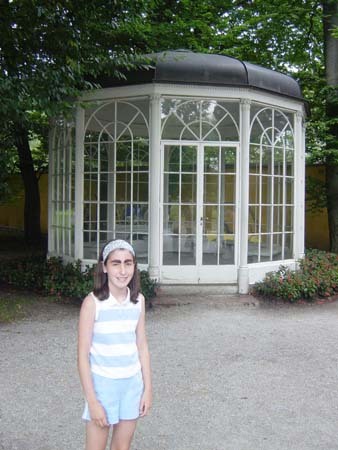 The afternoon was spent exploring Mozart's birthplace, residence and Mirabell Gardens. We learned a great deal about Mozart and then enjoyed his opera "The Magic Flute" at the famous Marionette Theater that evening. If Salzburg doesn't fill you with music, the Austrian countryside will definitely make you feel like singing! In the evening we headed back up to the Fortress for a Mozart chamber music concert. 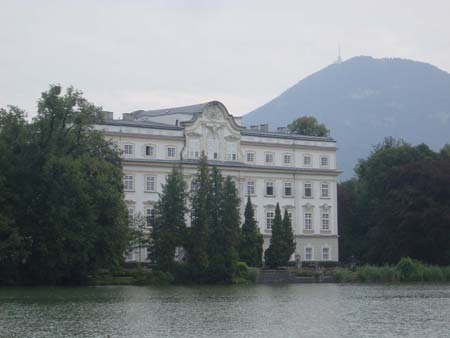 We loved our stay in Salzburg - there is a good reason for why this is one of the most visited places in all of Europe! 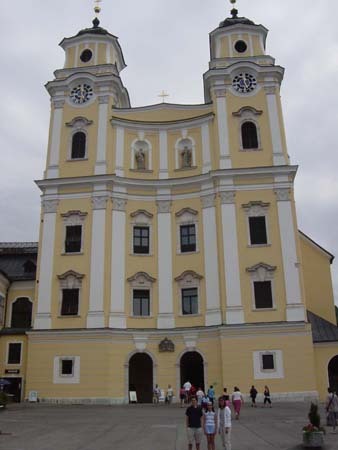 The Trapp family home, and the Mondsee Cathedral used for the wedding in the Sound of Music.